Many people treat their pets as family, and justly so. Well, when one of your children, or another family member has a rash or infection you take care of it as quickly as possible. Pets also deserve the same quick attention to keep them healthy. Instead of a huge vet bill, why not try an herbal remedy when your pet gets attacked by fleas. Here are a few home remedy suggestions you can try. At the first sign of a flea, bathe your pet with a natural pet shampoo that contains flea-repellent herbs. Pennyroyal or eucalyptus oil boost the bathwater’s flea killing power. A badly infested dog needs a bath about every two weeks; a cat, about once a month. Especially in the Summer, wash the pets bedding in hot soapy water once a week, and dry it in a hot dryer. Also vacuum your rugs every two to three days. Ninty percent of fleas are found where your pet sleeps. They generally contain such herbs as rosemary, rue, wormwood, pennyroyal, eucalyptus, or citronella, and sometimes tobacco powder. You can also dust the powder, or just diatomaceous earth, in all the nooks and crannyies you can’t reach by vacuuming. 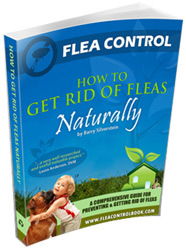 Diatomaceous earth is a great home remedy that removes the fleas waxy coating and dries them out, which kills them. Caution: Wear a dust mask to avoid the easily inhaled, finely ground diatomaceous earth used in swimming pool filteres; and pennyroyal and tobacco powder in large quantities can be toxic to you and your pets. Finally, add garlic and brewer’s yeast to your pet’s diet. Even try rubbing the yeast into your pet’s fur. Both ingredients are said to make a flea’s taste buds curl in disgust. There’s no scientific proof, but some pet owners swear by this home remedy. Preventitive care goes a long way with pets. Obviously they can’t talk to you and let you know that they are beginning to host fleas, so be aware of your pet’s behaviour and try these herbal remedies at the first sign. I have 2 cats, 1 cat does not have a problem with fleas, the other, I can say flea and he gets them. Both cats go outside. I know it sound strange. I will try your suggestion. I tried the drops between the shoulder blades and the 1 cat his fur came out. Willing to try anything natural. There are several kinds of DE. As a pool owner and also animal owner I know this. If you use DE, make sure you get the right kind as there is a big difference between food grade DE and pool grade DE. If would be awful to poison your pet by using the wrong stuff. Do your research. DE that is used for swimming pool filters is toxic to humans and will not control insects; therefore it is important to understand the difference. Other brands of DE advertised as “insecticidal” often include additives of toxic harsh chemicals such as pyrethrum and piperonyl butoxide – these products are not safe to eat and should not be administered to animals or humans. We have a shihtzu and we cannot get rid of the fleas. i have tried both advantage and frontline plus. neither seems to work, i wash his and our bedding etc every few day, vacuum every other day and have used sprays inside and outside in the yard, wherre he lover to play. i have even had him shaved. we found him a few months ago and this is a ongoing problem. any suggestions. i am about to lose my mind . FOOD GRADE DE is the only thing you should use on your pets. I use it, it works and my home is flea free! P.S. try to minimize the amount that is breathed in by you and your pet!